North Korea, cyberattacks widely viewed as ‘major threats’ to U.S. The public has long held the view that the United States is “less respected” by other countries than in the past. Majorities said this when Barack Obama was president, as well as when George W. Bush was in office. And today, 68% say the U.S. is less respected by other countries than it was in the past. 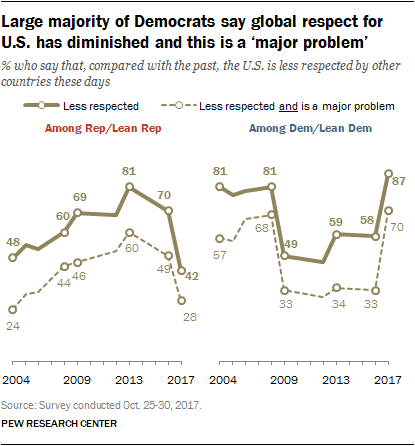 However, there have been substantial changes in how both Republicans and Democrats view the relative level of global respect for the United States. 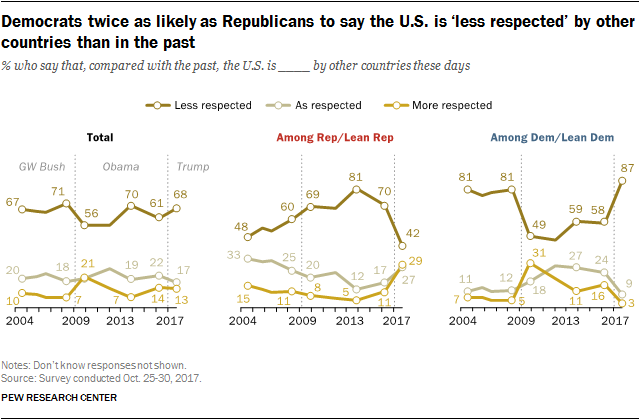 Today, 42% of Republicans and Republican-leaning independents say the U.S. is less respected by other countries than in the past, the lowest percentage expressing this view in more than a decade. And a much greater share of Republicans (29%) say the U.S. is more respected internationally today than did so during Obama’s presidency or Bush’s second term. Even at various points when Obama was in office, majorities of Democrats viewed the U.S. as less respected internationally; 58% said this last year. But now, 87% of Democrats and Democratic leaners say the U.S. is less respected than in the past, with 70% saying this is a major problem. And while fewer than half of Republicans (42%) say the U.S. is less respected than in the past, only 28% think this constitutes a major problem for the country. The national survey by Pew Research Center, conducted Oct. 25-30 among 1, 504 adults, finds that the public’s views of several global threats have changed since early this year. In particular, the number viewing North Korea’s nuclear program as a major threat to the well-being of the U.S. has increased, from 64% in January to 75% today. Opinions about other possible global threats to the United States also have changed. Nearly six-in-ten (59%) view global climate change as a major threat, up 7 points since January and the highest share saying this in surveys dating to 2009. By contrast, fewer Americans say Iran’s nuclear program is a major threat to the U.S. now (53%) than did so in late 2015 (62%). The public’s views of whether Russia’s “power and influence” pose a major threat to U.S. well-being are virtually unchanged since January (54% then, 52% today), while somewhat fewer say China’s power and influence is a major threat today (46%) than did so then (52%). As in the past, Republicans and Democrats are deeply divided over the seriousness of several possible threats, most notably climate change. More than eight-in-ten Democrats (83%) say global climate change is a major threat to the U.S. Just 28% of Republicans say the same, making it their lowest-rated threat, by far. 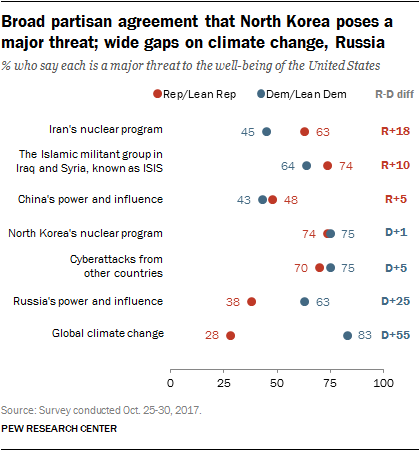 There also is a 25-point partisan gap in views of whether Russia’s power and influence constitute a major threat (63% of Democrats, 38% of Republicans), and an 18-point gap on Iran’s nuclear program (63% of Republicans, 45% of Democrats). 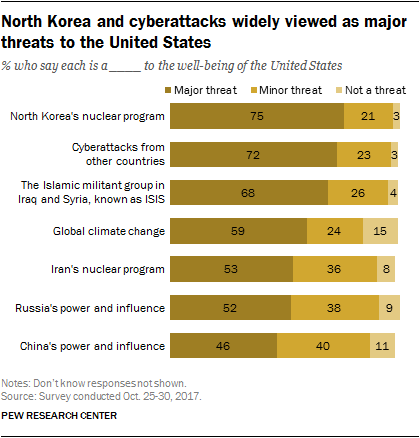 By contrast, there is much greater partisan agreement that North Korea’s nuclear program and cyberattacks from other countries represent major threats to the United States; 70% or more Republicans and Democrats say each is a major threat. For many years, Republicans and Democrats generally shared the same views about whether Russia represented a major threat to the U.S. In 2014, 58% of Republicans and 50% of Democrats said “growing authoritarianism in Russia” was a major threat and as recently as last year, 37% of Democrats and 46% of Republicans described “tensions with Russia” as a major threat. But partisan differences increased sharply after the presidential election, amid reports that Russia interfered in the campaign. 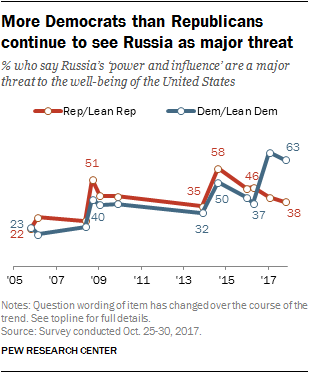 In January, 67% of Democrats and 41% of Republicans said Russia’s power and influence were a major threat. These views have changed little since January; currently, 63% of Democrats and 38% of Republicans say Russia is a major threat to the U.S.
About seven-in-ten Americans (69%) now say they approve of the U.S. military campaign against Islamic militants in Iraq and Syria, and 55% say it is going very (13%) or fairly (42%) well. 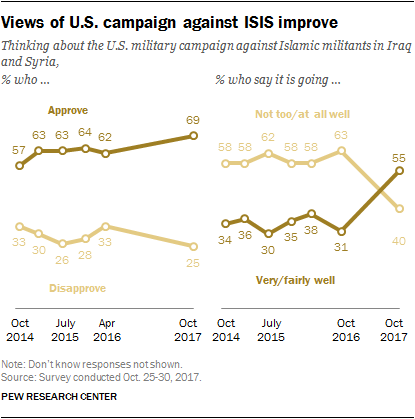 While clear majorities of the public have approved of the efforts to defeat ISIS since the campaign began, this is the first time in Pew Research Center surveys that a majority of the public views the military campaign in positive terms. As recently as last October, just 31% of Americans said the campaign was going very or fairly well. The overall change in public assessments of the military’s approach to the Islamic State is largely attributable to a sharp shift in GOP views over the past year. Today, two-thirds (67%) of Republicans and Republican-leaning independents say the campaign is going well. In surveys conducted throughout the first years of the military campaign against ISIS (and during Barack Obama’s administration), no more than three-in-ten Republicans said this. Though majorities of Republicans have approved of the campaign since the outset, GOP approval has increased since Donald Trump’s election: 82% currently approve, up from 64% last October and higher than at any other past point. By contrast, both Democratic approval of the military efforts against ISIS and assessments of the campaign’s effectiveness show considerably less change: 63% of Democrats now approve, nearly identical to the shares who said this throughout 2015 and 2016. And 50% now say the campaign is going very or fairly well, up eight points from the 42% who said this last fall. 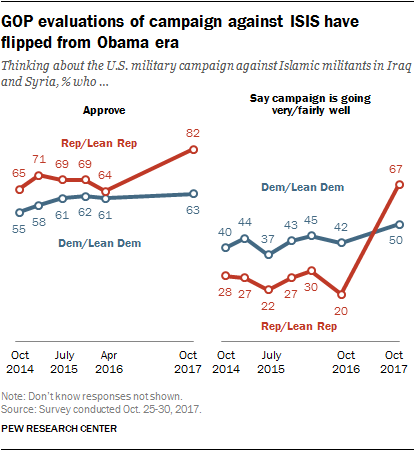 As a result, while there were only modest partisan gaps in approval of the campaign against the Islamic State over the last two years of the Obama administration, there is now a 19-percentage-point partisan difference. And while Republicans were significantly less likely than Democrats to say the campaign against ISIS was going well in 2016 (20% vs. 42%), today they are more likely than Democrats to say this (67% vs. 50%). Mixed views of effect of ISIS campaign on likelihood of attacks in U.S.
Nearly half of Americans (46%) say the American military campaign against ISIS has not made much difference with respect to the chances of terrorist attacks in the U.S.; about a quarter say it has increased the chances (27%) and a similar share (23%) say it has decreased these chances. 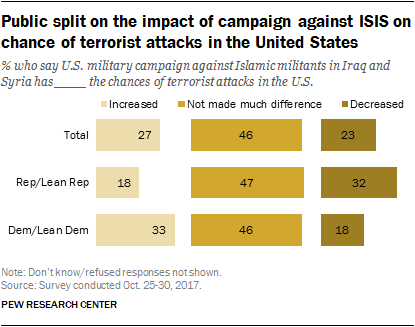 Roughly half of both Republicans and Republican leaners (47%) and Democrats and Democratic leaners (46%) say the campaign against ISIS has not made much of a difference when it comes to terrorist attacks on American soil. However, Democrats are more likely than Republicans to say the military campaign has increased the chances of a terrorist attack in the U.S. (33% vs. 18%), while Republicans are more likely than Democrats to say the campaign against ISIS has decreased the chances of a terrorist attack (32% vs. 18%). In 2014, when the U.S. first began its military intervention against ISIS, a similar question asked whether the U.S. military campaign against Islamic militants will increase, decrease or not make much of a difference on terrorist attacks in the U.S. Then, about one-third (34%) said the campaign will increase chances of a terrorist attack, while 18% said the campaign will decrease chances of an attack. About four-in-ten (41%) said the military campaign would not make much of a difference. As is the case today, Republicans (25%) were somewhat more likely than Democrats (15%) to say the military campaign would decrease the chances of a terrorist attack in the U.S.